Nearly 200 years since her death, Jane Austen is more popular than ever. I'd always been curious about her death at age 41. Certainly, there were many ailments in the nineteenth century that were unknown to medical science, so there has always been a lot of speculation concerning the precise cause of her death. The only thing literary sleuths have had to go on are descriptions of her symptoms in letters from Jane and her family. Because of this, her death has been attributed variously to Addison's disease, lymphoma, typhus or even a form of tuberculosis. Her only sister and mother both lived to ripe old ages, and so it would seem that if there was something contagious responsible for her death, that others in the household would have also been sickened. Enter author Lindsay Ashford and The Mysterious Death of Jane Austen. She's taken the known research into Austen's life and woven the details into a fascinating story that attempts to account for the strange death of the esteemed author. The book will be appreciated by Austen fans, because it takes a close look at the various members of Jane's family. I knew she was very close to her sister Cassandra, and I had a vague impression of a brother who inherited the family wealth (what there was of it), so I was surprised to learn that Jane had a total of 6 brothers. Because of this, the brothers, sisters-in-law (past and present), nieces, nephews and other various relations were a bit hard to keep straight. Still, it's pretty obvious fairly early on who the villain (or villainess!) of the story is. The story is told from the point of view of Anne Sharp, governess to Jane's niece Fanny. Because Jane visits her brother's family quite often, she and Anne form a friendship. When they are apart, they exchange letters and gossip about various family members. Anne and Jane both begin to suspect that one of Jane's brothers is a bit too friendly with his sister-in-law, Elizabeth. When Elizabeth suddenly dies, shortly after the birth of her 10th child, everyone assumes it's a complication of childbirth. Not until many years after Jane's death does Anne Sharp begin to suspect someone might have wanted to keep Jane from exposing a family secret. As she begins her detective work into the last few months of Jane's life, she also discovers that quite a few people in Jane's circle of family and friends had sudden and unexplained deaths that nevertheless didn't seem to excite any suspicion. Taking in all the similar symptoms (including an unusual skin discoloration), Anne deduces that all of the deaths were caused by arsenic poisoning, and she sets out to trace motives back to one particular person. 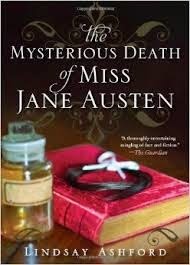 At the author's note at the end of the book, Lindsay Ashford mentions that there was a lock of Jane Austen's hair sold at auction which was later analyzed and found to contain "levels of arsenic far exceeding that observed in a body's natural state." Her interesting novel is an attempt to explain why someone close to her may have wanted to ensure Jane Austen's silence forever. I did enjoy reading the book and getting to know more about the Austen family (albeit in a fictionalized setting). I did think the unmasking of the culprit and his/her motives was a bit of a stretch, but I'm sure stranger things have happened. If poor Jane did have an abundance of arsenic in her body at the time of death, this explanation is as good as any!